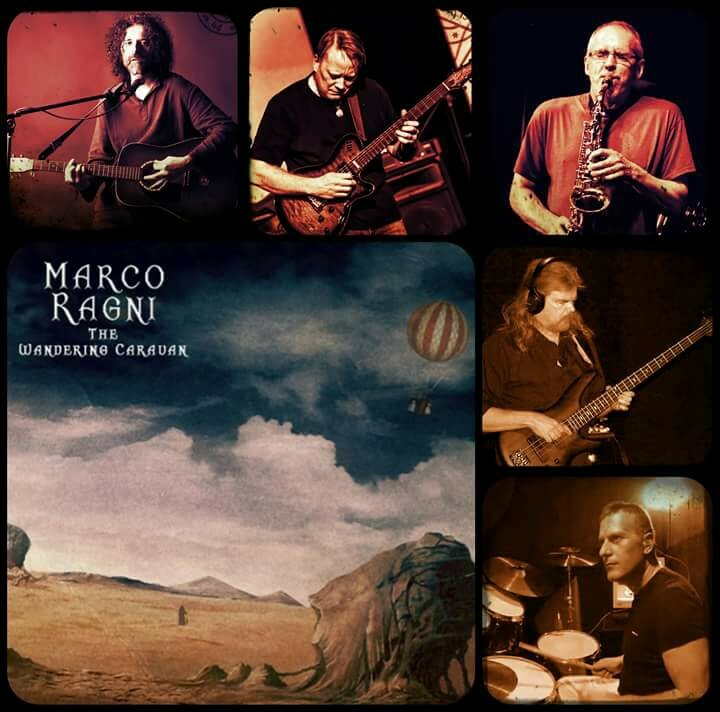 Critically acclaimed Composer and Multi-instrumentalist Marco Ragni is back with an amazing band and a brand new album, “The Wandering Caravan,” The new album has been receiving high praise in the prog community and abroad. Marco Ragni: Vocals, electric and acoustic guitars, bass, keyboards, mellotron, piano, mandolin. I started composing this album immediately after the release of Land of Blue Echoes, on March 2016. I was given a copy of “The death-defying unicorn” by Motorpsycho and I was pleasantly impressed. I was crazy about the use of the woodwinds on that record and I thought I wanted to write songs that could be arranged using them. So thanks to Ian Beabout, I met Dave Newhouse, a superfine musician. I sent him some tracks and after he recorded some arrangements on a couple of demos, I realized I had found a great musician, able to arrange to perfection, my ideas! I started thinking about the songs in a different way, trying to imagine them already with the woodwinds and so I started working with Dave at the end of spring 2017, after recording about 3 hours of demos. I then involved my friends and fantastic musicians, Peter Matuchniak and Jeff Mack, excellent guitarist and incredible bass player. And finally an Italian musician, drummer Maurizio Antonini from Rome, able to add perfect rhythms to my songs. In the album there are also some guests like Luca Zabbini leader of the Barock Project on Hammond, Ian Beabout on the Flute, Michael Zentner on the Violin and Nadav Yitzhak on the introduction of the album, playing the Oud. The album is about revolution, about searching for oneself, about metaphysical travel, about memories, about love and suffering. It talks about life, of how we live this Era. It tries to push us in search of ourselves, finding the best of us after having passed from the worst of us. It’s a journey into my life. It is passion. It is a desire for redemption. It is a dream and a reality. I have put all of myself into this production and I hope it will touch your hearts.